Congratulations on signing a contract to publish with Red Globe Press (RGP)! This page provides an introduction to who's who at RGP and the process of both submitting a manuscript for production and the production process itself. We'd advise you to read through the whole document as soon as possible after signing your contract and use it as a reference guide throughout the process. Your main point of contact at RGP is likely to be your Commissioning Editor, but you may well come into contact with other members of staff at various stages in the production and publication cycle. During the writing stage you should stay in touch with your Commissioning Editor or their Assistant. It is particularly important that you let them know if your plans for the book change or if you foresee problems in fulfilling any of the terms of your contract, such as the word limit or delivery date. They will be happy to discuss any issues or developments which arise as you work on the manuscript. Depending on the terms that you have agreed with your Commissioning Editor, you may be asked to submit draft material in batches and/or a complete draft manuscript for review by your Editor and their external advisors. Where this is the case, a pre-agreed amount of time will be factored into the writing schedule in order to allow for the time it will take to turn around reviews as well as the time it will take you to make final revisions once you've received feedback. Having checked, approved and accepted your final manuscript, your Commissioning Editor and their Assistant will pass it to the Production department and brief the Marketing department about the book. They will also brief the Rights Manager, who is responsible for investigating possible foreign language deals, and inform you of any such deals we secure. Thereafter, your Commissioning Editor and their Assistant remain your main contacts for all matters, other than copy-editing, typesetting, proofreading, and schedules, throughout the production process. They will liaise with you over the cover and page design as appropriate. The Production department is responsible for organizing the copy-editing, typesetting, proofreading, eBook creation and printing of your book. An in-house Production Editor will oversee these activities whilst managing the production schedule. The Production department works closely with your Editorial contacts and Marketing department. For information about Marketing and Sales, please read our Author's Guide to Marketing. For information about Rights please visit our Rights and Permissions pages here. Once you have signed your contract, your contact addresses and the royalty rate that you have agreed with your Commissioning Editor will be sent to our Royalties department. Once your book has published, unless you have agreed otherwise you will receive a royalty statement once a year in April. If any problems or queries on your royalty account arise, please email globalroyaltysupport@springernature.com. We hope you enjoy the production process and we aim to provide a professional and efficient service whilst producing your book to the highest practicable standards. In order to help us do this, we ask that you submit your manuscript in an appropriate form. The guidelines below offer advice on the most common queries from authors: text style; referencing style; manuscript layout; permissions queries; supplying artwork; and cover design. We do not impose a rigid house style as such, but there are certain conventions that we'd like our books to conform to and so encourage our authors to adhere to the styles outlined here during the writing process. If you are in any doubt about style, please do contact your Commissioning Editor, but remember that consistency and clarity are important above all. Spellings should be consistently either English or American. Please check which your Commissioning Editor would prefer. Use -ize or -ise spellings consistently for words such as globalization/organization. Generally we prefer -ize, especially if the title of the book contains such a word. Spelling foreign words. In works dealing with foreign countries or foreign languages, especially those with alphabets different from English, please decide on the spelling or transliteration style of names and words at the outset and remember to use consistently. If you're using any special characters/diacritics please also provide a PDF of your manuscript on submission. Abbreviations consisting of capital initial letters don't have full stops – GNP, USA. Contractions ending with the same letter as the original word do not take terminal full stops (e.g., St, Mr, Dr), but abbreviations where the last letter of the word is not included do take a full stop (e.g., ed., ch. – thus ed. and eds are both correct). Abbreviated units of measurement do not take a full stop (e.g., lb, mm and kg) and do not take a final ‘s' in the plural – 7lb, 10mm. Common abbreviations such as etc., i.e., and e.g. are fine to use throughout but should be styled consistently. Dates should be styled 18 May 2016, and decades as the nineties or the 1990s (without an apostrophe). Numbers one to ten are expressed in words, but 11 upward appear in figures, unless if being used in general terms – for instance, about a hundred people. Another exception is that where there are multiple numbers given in the same sentence, all numbers should be expressed in the same way. Wherever a unit of measurement is used the number preceding it should appear in figures, unless it is used in a very general sense such as hundreds of miles. Inclusive numbers should include the fewest possible digits: 32–3, 132–48, 200–5, except in ‘teen' numbers, where the 1 is repeated, 1914–18. Dates should be elided to the last two digits: 1997–98. Page numbers should use en dashes, not hyphens. Decimal points should appear as full stops on the line. Please mark clearly, either as a note within your electronic file or on a printout of the relevant page, the difference between the capital letter O and zero and between lower-case l and figure 1 where there may be doubt. Initial capitals are used to distinguish the specific from the general – for example, ‘she is Professor of Economics at …', but ‘he is a professor at a …'. Headings, sub-headings, table headings and figure captions should not have full stops. They should consistently follow the same form of capitalization; either title case (e.g. ‘This is a Short Heading') or sentence case (e.g. ‘This is a short heading'). Hyphenation. In general this is being used less frequently in compound terms – for instance, microeconomic. You may go with your preference, but clarity of meaning and consistency throughout the book are the most important considerations. Parentheses (or round brackets) are used for simple interpolations, and square brackets for editorial notes or interpolations in quotations. For UK style, parenthetical dashes should be spaced en dashes, and for US style should be closed em dashes (not hyphens in either case). - Please number Parts of your book I, II, III and refer to them in the text as Part I, Part II, Part III. Chapters or Units should be numbered 1, 2, 3 and referred to in the text as Chapter 1, Chapter 2, Chapter 3. Cross-references to other pages within the book can cause problems at proof stage. If possible please refer to chapters or sections of text rather than to pages. Cross-references to parts, chapters, figures etc. in the same book should be capitalized (e.g. Part II, Chapter 3, Figure 4.5), but cross-references to the same in a different book should not. Try to use gender-neutral language where possible: ‘his or her' or ‘their' rather than just ‘his'. Ellipses should consist of three spaced dots with a space on either side. When the last part of a quoted sentence is omitted and what remains is still a grammatically complete sentence, a period followed by three spaced ellipsis dots may be used (using only three ellipsis dots is also acceptable, but your style should be consistent). If following UK style use single quotation marks for quotes and double quotation marks for quotes within quotes; final punctuation should be within quotation marks if a complete sentence is quoted. Final punctuation will be outside quotation marks if the quotation forms only part of a sentence in your running text. If using US style then single quote marks should be used inside double and end punctuation should fall within quotation marks in the case of commas and periods, and outside quotation marks in the case of colons and semicolons. Direct quotations should appear as in the original source and should not be changed to conform to our house style. However, when doing your own translating, you should follow book style. All quotations must be accompanied by a citation, placed in parentheses directly after the closing quote mark and before punctuation (if applicable). Displayed extracts (direct quotations set off from the main text when they exceed 60 words in length) do not require quotation marks. When you wish to interpolate your own words within a quotation, place them in square brackets. All quotations must be accompanied by a citation, placed in parentheses directly after the closing punctuation on the same line. In text, per cent should usually be spelt out and the number should appear in figures – 54 per cent. In tables the % symbol can be used. Close up spaces between paragraphs unless the spaces are clearly purposeful; in which case, mark them as a special design element, for example, with three asterisks. Key terms: if you have agreed with your Commissioning Editor that it would be helpful to include key terms within your text, please highlight these in bold in the first instance. Number Tables and Figures according to chapter and figure/table number (e.g., Table 1.1 for Table 1 in Chapter 1, Figure 2.3 for Figure 3 in Chapter 2, and so on). In the text, please direct readers to ‘see Table 1.1' (or Figure 2.3) rather than giving page numbers or using general terms such as ‘above' or ‘below'. In some cases you may be using illustrative artwork that you don't want to include in the general figure numbering (e.g. photographs which appear in the margin or those which have been used to add colour and interest). If so, please name the callouts consistently and in a way that is clear what should be placed where. Or if you wish to identify artwork that appears in boxes separately to the figures throughout the text please label them logically, for example, B1.1. If in doubt, discuss with your Commissioning Editor. More details about supplying artwork can be found below. While the Copy-Editor is responsible for ‘tagging' the manuscript in preparation for the Typesetter, it is advised that any features/boxed material are clearly labelled as such so that it doesn't become muddled with the main text. Should you wish to flag any particular note for the Typesetter (e.g., details on the layout of a particularly complex table), please insert your instruction within angle brackets to distinguish it from the rest of the text. We recommend creating a list of your stylistic decisions that you can submit with your manuscript. This list can then be followed by the Copy-Editor and Proofreader later in the production process and enable them to ensure consistency. For books with two or more authors, or edited collections, a style list can help ensure that all authors and contributors are writing in the same style. Notes and Bibliographies normally appear at the end of the book (in this order, if we have both), but sometimes in multi-author works may appear at the end of individual chapters. We prefer not to have on-page footnotes. Please ensure that any notes and/or references are double-spaced and in the same size type as the rest of the typescript. Please check that there are no omissions or repetitions and that the number of notes in each chapter corresponds with the number of notes in the notes section. Similarly, please be sure that each citation in the text has an entry in the Bibliography. For repeated entries we prefer you not to use ibid. and op.cit., but instead to use author name and an abbreviated title. Repeated entries must be given in full at first mention in each chapter's references. Referencing styles vary significantly from one discipline to another. Whilst we prefer to use the Harvard style of referencing (more details below) we do not insist on a particular style (unless your book is in a series which has an established style). However, any style you do use should be consistent. Your Copy-Editor will ensure your references are consistent and they will query anything they are unsure of, but you will save a lot of time and many queries if you ensure your notes and references are presented in good order when you submit your final manuscript. Harvard referencing provides the abbreviated details of the source(s) quoted or referred to in parenthesis directly in the text e.g. (Jones, 2014, p.10), with a corresponding full entry in the Bibliography. S. Blinder and R. M. Solow (1999) ‘Analytical Foundations of Fiscal Policy', Journal of Finance, XXV, 47–54. Please note that the abbreviations ‘p.' and ‘pp.' may be omitted for articles in journals. in notes but not bibliographies, the page number(s), if appropriate. H. B. Garland (1999) A Concise Survey of German Literature, 2nd edn (London: Red Globe Press), p. 84. Freund, B. (1999) ‘The Making of Contemporary Africa' in B. Smith (ed.) A History of Africa (London: Red Globe Press). When referencing websites try to use as simple a method as possible, avoiding the inclusion of lengthy addresses for individual web pages, especially when these are likely to have changed by the time anyone looks for them. Our general advice is to try to apply the same principles to web references as to book or journal references. If using the Harvard referencing system, it is best to think of a concise ‘author' to use in the text reference and spell out the full ‘author' in the bibliography. If referring to the home page of the European Commission you might abbreviate this to ‘Europa' using a, b, c, etc. to distinguish references to different pages hosted on the Europa site. If the document you are referring to has a date this should be used in the reference in the text. If not, as in this case, you should use the date accessed instead. So if you accessed it on 14 February 2016 this reference might be (Europa, 2016a) and the corresponding entry in the bibliography: Europa (2016a) Secretariat-General of the European Commission, http://ec.europa.eu (home page), date accessed 14 February 2016. Or if you want to reference the individual page: Europa (2016a) Secretariat-General of the European Commission, http://ec.europa.eu/dgs/secretariat_general/index_en.htm, date accessed 14 February 2016. Where possible, access dates should be included consistently for every web reference. If in doubt, discuss with your Commissioning Editor. If citing from other media, we suggest you help your reader by identifying the medium, e.g. ‘blog', ‘podcast', ‘interview', ‘questionnaire', in the reference details, and include any information you think will be useful to the reader. clear and consistent differentiation between chapter titles and different levels of headings and subheads (note, it is best to avoid using all capitals to indicate headings as the caps often need removing to fit the final text design style). Overall, it is important to be consistent with your layout as it will make it easier for both Copy-Editor and Typesetter. Once your manuscript is copy-edited a professional Typesetter will set the book according to the specified design. Excess formatting created in word-processing programs is usually lost in conversion to typesetting programs so it is advisable not to spend time on the layout unnecessarily. Please use commonly available fonts such as Arial, Calibri or Times New Roman. Editors should include a ‘Notes on Contributors' section in the prelims in which each contributor is described in one to five sentences. Contributors can be listed here alphabetically. The descriptions should include each contributor's affiliation and/or profession. Each contributor must approve and agree to this description. We must also receive a signed contributor's agreement for each chapter – please see the form that will arrive under separate cover from your Editorial Assistant. Please ensure that contributor names are spelled and presented consistently throughout. When printed, preliminary pages, or ‘prelims', are numbered in roman numerals. Your Editorial Assistant will create the first four pages: half title, series page (blank if series not applicable), title page and imprint/copyright page, but all other preliminary material must be provided by you on submission of your manuscript. Prelims can vary hugely in length but generally include contents page(s); lists of figures and tables; lists of abbreviations and/or acronyms; a preface; and acknowledgements. You may also wish to include information on how to use the book or details of companion website material. Please note an introduction should be the first chapter in the book and not part of the prelims. Endmatter can include, in roughly this order, appendices, notes/references, a bibliography, a glossary and index(es). Their titles should be included in the Contents. Artwork includes any illustrative material that you wish to include in your book; this can vary from photographs and cartoons to diagrams, charts, sketches, maps, graphs etc. Generally, we count tables separately to other illustrative material because they are treated more like text throughout the production process. Please discuss any ideas for artwork with your Commissioning Editor at the earliest stage possible. The guidelines below should help you submit all artwork to the print standard desired, but if at any stage you have any queries ahead of final manuscript submission, do check with your Editorial team. Artwork includes any illustrative material that you wish to include in your book: photographs, diagrams, charts, sketches, maps etc. Generally, tables are always counted separately as they are treated differently throughout the production process. Remember, if you are using artwork from a third party source, you must obtain permission. There are detailed guidelines on seeking permissions here. Please ensure you provide the relevant paperwork and permissions tracker (see here) to the Editorial Assistant when you submit your final manuscript. Unless otherwise agreed, all artwork will be produced in black and white so it is important to think about how the artwork will appear on the typeset page when selecting an image. For example, if you have a bar chart with 5 different coloured data points on it, ask yourself if you'll be able to distinguish between the colours when it is converted to black and white. Similarly, think about the location of figures: it is generally advised that figures should not be placed too closely together; roughly 400 words between each figure ensures that artwork is spaced evenly throughout the book, but with highly illustrated titles this may be difficult to achieve (if concerned, please discuss with your Commissioning Editor). You must provide a callout in the text, a caption and appropriate source line to accompany all artwork. You must provide a callout in the text (e.g. [Figure 6.1 inserted about here]), a caption and a source line (if applicable) to accompany all artwork. As mentioned above please do not refer to figures in the text by location (e.g. ‘see below') but instead refer to them by title (e.g. ‘see Figure 6.1'). Please note that the Typesetter will place figures as close to their call-out as possible, but for pagination reasons it may not always be possible to place them exactly where the call-out falls in the manuscript. Line art is defined as having no gradations of tone or shadings, can include maps, diagrams, sketches, graphs, or charts, and are drawn with lines, dots, crosshatching, or solid black shapes. Halftones are defined as having gradations of tone or shadings, and include photographs, transparencies, painted artworks, drawings or sketches. For halftones, please supply the image file at the final desired printed size or larger: 300 dpi or above and roughly 1500 pixels wide. Ideal formats are .tif or .eps, but we can also accept compressed formats such as .jpg, .gif and .bmp if quality of the printed image is not crucial. 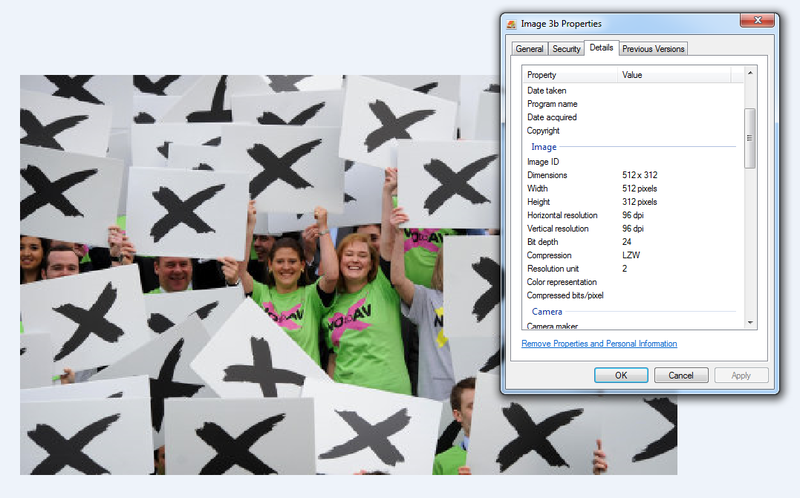 To produce a print quality image, the minimum resolution should be 300 dpi at the size the image will be printed. The quality or resolution of an image is determined by the number of pixels (dots) per inch (dpi). The number of pixels an image contains is also closely linked to the size the image can be reproduced at. If we stretch a low quality image to fit the printed page, the image will become pixelated and detail will be lost. The optimum print resolution is 300 dpi to 600 dpi. As an approximate guide an image that is approximately 1500 pixels wide and 300 dpi will fit a standard book size (at about 12.5cm on the printed page). A simple equation allows you to see the size of your images, by dividing the width by the desired print resolution, then converting from inches to centimetres: (1500 ÷ 300) x 2.5 = 12.5cm. Example: In Windows Photo Viewer you can right-click on an image and select ‘properties’ to see the pixel width and dpi of an image. This example has a horizontal resolution of 96dpi and is 512 pixels wide. This means it would be about 4.26cm wide on the printed page: (512 ÷ 300) x 2.5 = 12.5cm. In Windows Photo Viewer you can right-click on an image and select ‘properties’ to see the pixel width and dpi of an image. This example has a horizontal resolution of 96dpi and is 512 pixels wide. This means it would be about 4.26cm wide on the printed page: (512 ÷ 300) x 2.5 = 12.5cm. Both line art and halftone images need to be of the highest possible quality. Photocopies and web downloads are almost never of sufficient print quality and are often accompanied by permissions issues. If you have any questions about the quality of the figures you wish to include, please submit a sample to your Commissioning Editor who will then consult with the production department. When submitting the final manuscript files, please only provide the artwork you wish to include in the book (do not provide alternatives). Artwork files should be labelled clearly and consistently to avoid any confusion. If you have any hard copy figures such as print photographs, architects' plans or transparencies, please submit these with details of a return address. The Production department will scan these to the necessary print quality and return them safely to you. All photographs or halftones should be submitted as separate files, in .tiff or .jpg file format. They should be at the final desired printed size or larger and at 300 dpi or above. Do not submit halftones ‘dropped' into a Word file as this will reduce the quality of the image significantly. Similarly, do not convert your colour halftones to black and white yourself as much of the original richness of the image may be lost; the Typesetter will have the appropriate software to do this in a way that will ensure the highest quality in print. Line art should be submitted in the program it was created in. For example, if you have drawn a figure in Word, then it is acceptable to submit this is Word, or if you have created a graph in Excel, it is acceptable to submit the .xls file. If you have detailed graphs that have been created in Microsoft Excel then it is best to always submit the data files that have been used to create the image. The illustration checklist (available here) can be a helpful tool to track your artwork, permissions status, and provide instructions for redrawing/relabeling. 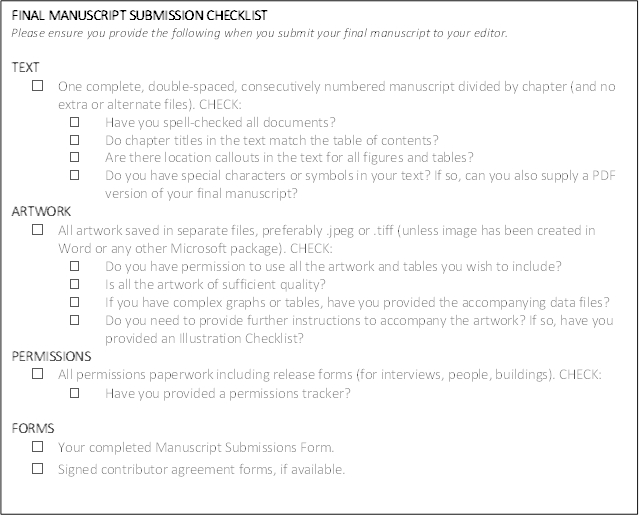 We would recommend completing the checklist if you have 20 or more figures in your book and ask you to submit it along with your final manuscript. Before typesetting begins, all artwork will be assessed to see whether any relabels or redraws are required. If permissions allow, we may wish to carry out simple redraws to ensure that artwork looks in keeping with the overall book design. Tables are most frequently created in Word and are treated slightly differently to all other artwork. When creating a table in your manuscript please use the ‘insert table' function in Word rather than a series of ‘tabs' or ‘spaces' to put text into columns. Using the proper table facilities in Word will mean data in the columns is at less risk of moving when it comes to typesetting. Please let us know if any tables in your manuscript require special treatment; if they are very wide or very long, or if it is important they are to be set opposite a particular figure for example.keeping with the overall book design. The design of your cover will be coordinated by your Commissioning Editor and their Assistant and a Designer, along with your Production Editor and our Marketing and Sales department. You will be asked for design input by your Editorial Assistant. If you have an image you would like us to consider incorporating please have it approved by the Commissioning Editor in advance of the final manuscript delivery date. Do not purchase art for the cover without your Commissioning Editor's approval; we may be unable to use it for permissions, marketing, branding, or other reasons. Generally, it is preferable to deliver each text item as a separate file, for example: preliminary matter (title page, copyright page, dedication, table of contents, preface/acknowledgments, or foreword should all be in placed in one file), introduction, individual chapters, and bibliography/references. Every file must be saved in the same program. Remember to check all of your files very carefully before you submit your manuscript. Special characters and italicization in particular can be susceptible to automatic alterations imposed by word-processing programmes. If you wish to submit your manuscript in LaTeX, please discuss with your Commissioning Editor as soon as possible. We will request a sample chapter several months before final submission which we will send to the Production department for testing. This enables us to identify any potential issues with the files and allows us enough time to correct any problems before production begins. All LaTeX files should be delivered with an accompanying PDF produced from the final files. There should be no differences between the TeX files and the PDF. When you deliver your final manuscript to RGP, we expect that the manuscript is ready for production and all suggested revisions from the Commissioning Editor, series editor (if applicable), and peer reviewer(s) will have been fully incorporated. Next, your Editorial Assistant will ensure that you have provided everything we need in order to progress to production, including relevant permissions (see here) and permissions tracker; all artwork and accompanying illustration checklist (if using); and the author marketing form. Once satisfied that the manuscript is ready, the Editorial Assistant will complete the handover to Production. 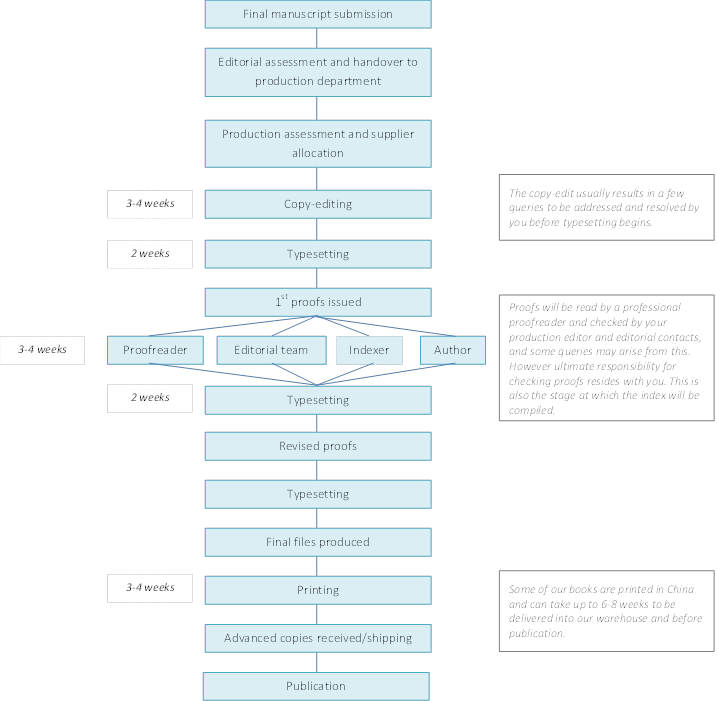 The following is an overview of the stages that your book will complete during the production process. Once your manuscript has been transferred to production, you will be contacted by a Production Editor who will provide further details on the production process as a whole as well as a proposed schedule that will outline the dates through until publication. Once the Production Editor has assessed the manuscript, they may pass it to a dedicated Project Manager to oversee the production process, though they will still be on hand to address any general production-related queries or concerns you may have. The Copy-Editor's responsibility is to read your manuscript carefully and to correct and edit in order to ensure accuracy in spelling, grammar, punctuation, word usage and style, and general consistency throughout. In addition to the above, the Copy-Editor will ‘mark up' or ‘tag' the manuscript for the benefit of the Typesetter; this means that the Copy-Editor is clearly identifying the individual features of your book that need to be set in different styles. The ‘tags' will not interfere with your work and will not be visible in the proofs or final book. Where possible, we use Copy-Editors that have an understanding of the relevant subject area; however, it is not the Copy-Editor's responsibility to fact check your work. The Copy-Editor's responsibility is to read your manuscript carefully and to correct and edit in order to ensure accuracy in spelling, grammar, punctuation, word usage and style, and general consistency throughout. If you wish to see a sample copy-edited chapter before the Copy-Editor continues to edit the complete manuscript then please let us know when you complete the submissions form. The submissions form also gives you the opportunity to select how you'd like to receive queries from the Copy-Editor (as an email list or a Word tracked changes file, for example). prepare your index (if applicable). Your production contact will send you some specific instructions on how to use the PDF mark-up tools (if required). We encourage you to use these proofing facilities as they enable you to correct and edit your proof with little ambiguity and can save the Typesetter a considerable amount of time when taking in corrections. If there are more than two authors, or you are working on an edited collection, all corrections must be collated and returned as one complete set to your production contact. Please bear in mind that the more corrections you make the more costly the production process becomes and the more opportunity there is for errors to creep in. You should be making essential changes only and consider the effect of the changes you are requesting will have on the pagination. For example, removing a figure or table without replacing it with something of a similar size will cause the resulting text to reflow, which will also affect the index. We aim to provide you with as much time as possible to check the proofs, but it will be in the region of two to three weeks; please return the proofs as promptly as you can to avoid incurring delays in the production process. The Proofreader's responsibility is to read the text closely and mark up any spelling or grammatical errors; they are also on the lookout for any inconsistencies and will be using style sheets provided by the Copy-Editor to check against. Whilst you are checking the proofs, they will also be sent to a professional Proofreader and be checked internally by the Production Editor and Editorial Assistant. The Proofreader's responsibility is to read the text closely and mark up any spelling or grammatical errors; they are also on the lookout for any inconsistencies and will be using style sheets provided by the Copy-Editor to check against. The Proofreader will not contact authors directly but instead they will send a list of queries to your production contact which will then be passed on to you if necessary. Do bear in mind that, although we use professional Proofreaders, the ultimate responsibility for checking the proofs lies with you. If you have agreed to provide an index for your book remember that this must be compiled within the time allowed for proofreading so that you return the marked proofs and index copy simultaneously. You will not be sent a revised set of proofs unless otherwise agreed or your Production Editor deems it necessary. All corrections will be checked very carefully by your Production Editor and they may see several more sets of proofs before final text files are requested. Generally, we encourage all authors to prepare the index themselves as no one knows your book as well as you do. If you are indexing yourself there are detailed guidelines here. We would encourage you to think about the terms you want to include whilst you are finalizing the manuscript. We ask you to prepare the final index when the proofs are available and the final page numbers can be added to entries; making a head start by already having a list of indexing terms can make this a much easier process. When you submit your proof corrections you should also submit a Word document of your index. This will then be typeset at the same time that your corrections are incorporated into the proofs. If a professional indexer is compiling your index for you (either commissioned by yourself or RGP) we also encourage you to provide us with a list of terms and preferences for your index. We commission experienced indexers with knowledge of the appropriate subject areas but all indexes can be subjective to the reader. If you have a clear idea of what should/shouldn't be incorporated, please let us know ahead of time. Before we set a commissioned index we will send it to you for your approval. Once the Typesetter receives the corrected proofs and index, he will make all the corrections and typeset the index. The Typesetter's work will be checked, and then he will create final files, and we will proceed with the printing of the book. Usually, you can expect to receive a copy of the finished book six to ten weeks after returning corrected page proofs. Where books are printed outside the UK your Commissioning Editor will normally send a copy to you as soon as they receive advance copies from the printer via our Production department. Your contractual complimentary copies and any copies we are contractually committed to send to contributors of chapters, etc. (your contract will specify the exact number) will be sent out as soon as bulk stock is received in our warehouse. Once final print files have been delivered we will convert your book into eBook formats which will then be distributed to eBook vendors and released approximately 2 weeks before the release of the print book. There are two main types of eBook format, which all of our books are converted to as standard: ePDF and ePUB. ePDFs are compatible with most e-readers and have the same properties as a regular PDF, which means the layout is ‘fixed'; if you zoom in on the page using your e-reader, the content will remain identical to how it looks on the printed page. ePUBs are ebooks which conform to an industry accepted standard and they generally have a ‘reflowable' layout; if you zoom in, the text reflows and all the features on the page adjust to fit. ePUBs also have a wider range of accessibility features than ePDFs. Artwork A term used to describe the illustrative matter in your book – from straightforward charts to freehand drawings and photos. Copy-editing Detailed work on your book to ensure accuracy in spelling, grammar, punctuation, word usage and style, and consistency in all of the above throughout. Cover blurb A brief description of your book and yourself, printed on the back cover. DPI Dots per inch – the number of dots contained per inch in a text or illustration file – the larger the dpi the better the quality. EPS (.eps) Encapsulated Postscript – a file format used to transfer PostScript image information from one program to another. JPEG (.jpg) Joint Photographic Experts Group – easily compressed graphics file format. Manuscript Your book, as delivered by you to the Commissioning Editor. PDF Portable Document Format – software allowing reduction in file size to make documents more easily transportable. A secure method of ensuring file formatting is retained no matter what hardware is used to open the file. POD Print on demand, where a book is set up for printing the number of copies that a customer orders, from 1 copy , instead of the more traditional method of printing a set number of copies dependent on sales forecasts of the title. Postscript A page description and programming language; electronically describes the typesetting. Printer A supplier appointed to print and bind your book; in other words, to produce the final product. Project manager A contact person assigned to you by your Production Editor. Proof Produced by the Typesetter to show book pages in their final form. Your chance to check the accuracy and layout of the typesetting and to produce or finalize your index. Schedule A sequence of events and deadlines agreed for production of your book to get it to the marketplace at the optimum time. TIFF (.tif) Tag Image File Format – a file format for the storage of bit-map graphics and scanned images. Useful for images where quality is important. Typesetter A supplier who will take your copy-edited manuscript, apply specified type styles and design, and produce a proof of the typeset pages. Responsible for implementing all corrections and supplying the print-ready PDF. Unicode An international standard that assigns a unique identifier to a huge number of characters across international languages, ancient and modern, ensuring compatibility of fonts across different typesetting systems.